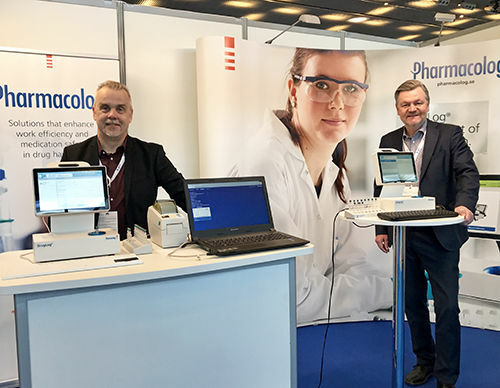 Representatives from Pharmacolog have during the last few weeks participated in three important fairs and conferences; EAHP in Barcelona, ​​Child Week (Barnveckan) in Örebro and NADDI, in St. Petersburg Florida. All meetings were very rewarding and show an increasing interest in the company’s technology from both potential partners and customers. EAHP, or European Association of Hospital Pharmacist, was held this year in Barcelona 26/3 – 28/3 and is the largest European pharmacy conference with over 3,500 delegates. Clear focus at the conference was increased interest in systems for safe drug handling. Above all, delegates from Germany showed an increased interest in Pharmacolog and DrugLog® as they in Germany have had incidents with chemotherapy preparations that proved to lack active substance. The Child Week (Barnveckan) is a Swedish meeting for doctors, nurses and pharmacists in pediatric care. The meeting was held this year in Örebro on April 1-4 with over 1000 delegates and about 40 exhibitors. The theme for this year was “the severely sick child” where a substantial part of the program was allocated to questions about medication. NADDI, the National Association of Drug Diversion Investigators, is an organization that carries out healthcare training in preventing Drug Diversion. Each year NADDI organize a larger meeting where the focus is on sharing experiences and discussing technology and methods. In connection with this, an exhibition is held for companies in the industry. The meeting was held this year in St. Petersburg Florida and a total of 200 delegates, all of whom work in hospitals responsible for the Drug Diversion Prevention program.